The 6th annual event will feature Alex Tattersall, Martin Edge and Ethan Daniels as our visiting photo professionals. If you want to spend time with these World Class photographers in this unique diving location this is the time to come to Lembeh Resort. These renowned underwater photographers, supported by our in-house Photo Pro Sascha Janson and in-house Marine Biologist Dimpy Jacobs, will be your coaches throughout the week to make sure that you take home the images you hoped for and more. This well-rounded team of experts will provide presentations, seminars & one-on-one instruction. 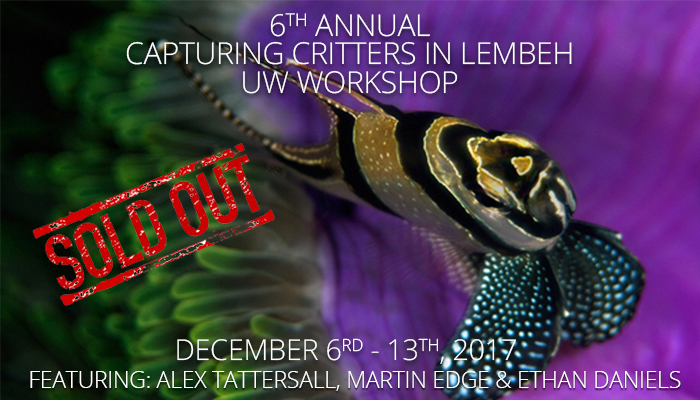 With their intimate knowledge gained through years of diving the Lembeh Strait, they’ll be discussing the best time to photograph a critter, lighting techniques, how to get the most out of this unique environment plus photo organisation and editing strategies. “Workshop Member Time” (one-on-one) with the pros: maximize your learning curve during surface intervals and master the techniques presented or sort out your processing woes. Price includes: airport transfers, all meals, snacks, local brewed coffee, tea, unlimited drinking water and taxes. Stay longer & learn more! Join our optional 3 night Advanced Workshop extension to learn more in-depth techniques from our Pros and maximize your photography progress.